It feels like forever since I’ve blogged. 2018 has seen me make two trips – one to Vienna and one to Dallas and California – the latter I didn’t blog as it was a family holiday. I’m back though – as earlier this year I found out I was going to be going on a bonus holiday. I’m all for that! My mobile ‘phone company, Three, has an app called Wuntu which is like a not so good version of O2 Priority. They were running a competition over the course of a month whereby they were giving away 100 free flights a day. I spotted it pretty early on so entered every day, thinking the odds might be quite good. Lo and behold, a couple of days after the competition finished I got an e-mail saying I’d won a flight. There were loads of hoops to jump through though. You had to choose your originating airport, three destinations you’d be happy with, then three dates you could travel. The travel agency would write back with an offer of a destination and date with 14 days. Then you had 48 hours to accept and add any other people on to the flight (any other travellers would need to pay). Then within another 14 days you’d get an offer – which you had 48 hours to accept. I think the process was probably deliberately complex to stop you bothering, but I stuck with it! I thought the destinations from Belfast would be anywhere Easyjet or Ryanair flew, but I was pleasantly surprised by the ten choices available. I picked Milan, Madrid and Oslo as my three potential destinations (you can’t fly to any of them direct from Belfast, so I thought they offered better value). You can probably guess where I ended up thanks to the title of this post. 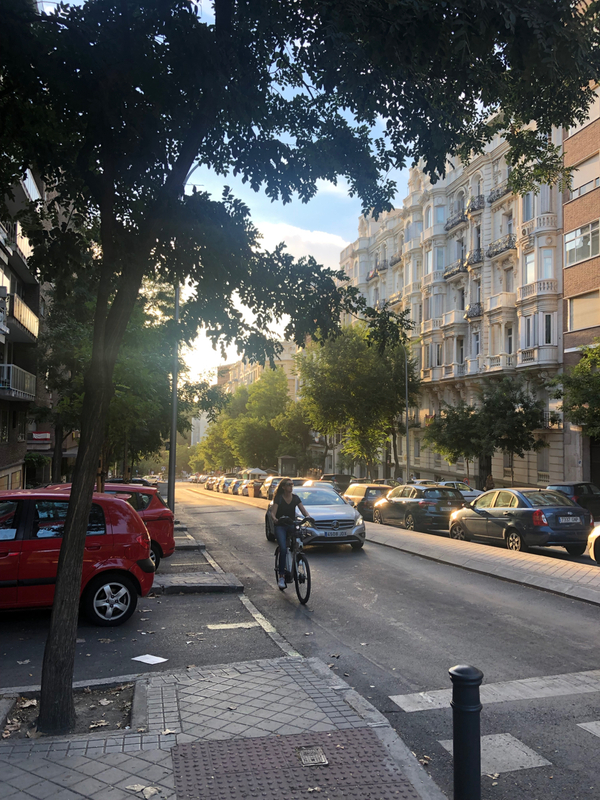 Though I’d been in Barcelona a couple of years ago, I’d never visited Spain’s capital city so I was excited to see it – and experience a bit of sunshine while it was lashing rain and blowing a gale in Belfast! My British Airways flight to London Heathrow was pretty non-eventful. I watched a bit of River City and before I knew it I was walking off the plane. A quick show of my passport and a trip up an escalator, and I was in the main departures area of Terminal 5. 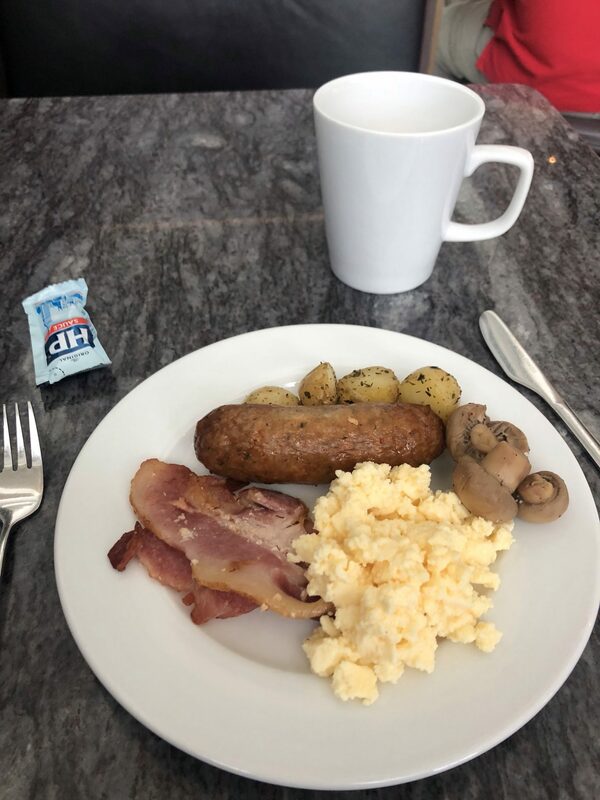 I headed to the lounge for a bit of breakfast…. The healthy variant obvs! 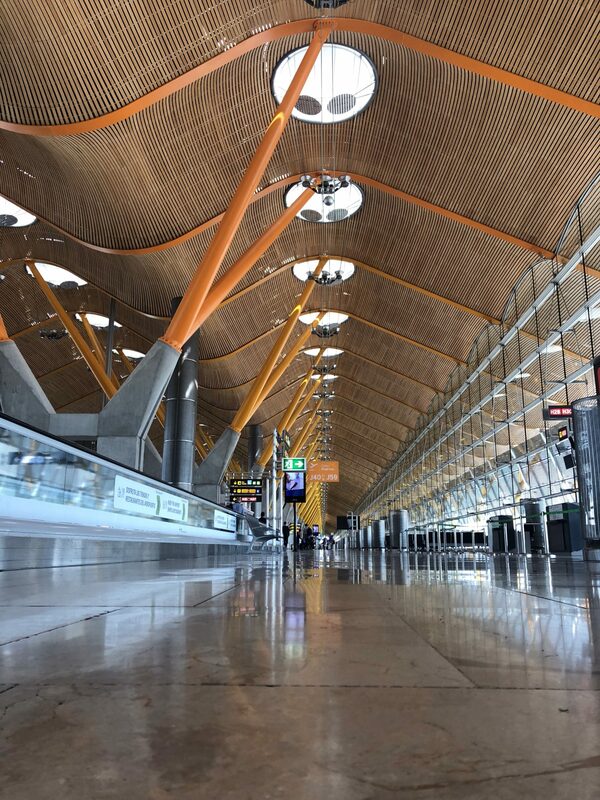 Then I walked right to the other end of the terminal for my flight to Madrid. The air bridge to the plane was very, very long, and as I walked past two men I heard them say something about not knowing it was a race. Dudes that’s just the speed I walk at, I can’t help it if you walk slowly! I was confused as to who was going to be operating my flight to Madrid. Some of my flight numbers were British Airways numbers, others were Iberia. It turned out this was an Iberia flight – my first with them. The stewardesses were really friendly, but the plane was absolutely rammed – I think there were only about three free seats. There was a big palaver with people saying there was no room in the overhead bins for their bags, but eventually things settled down. 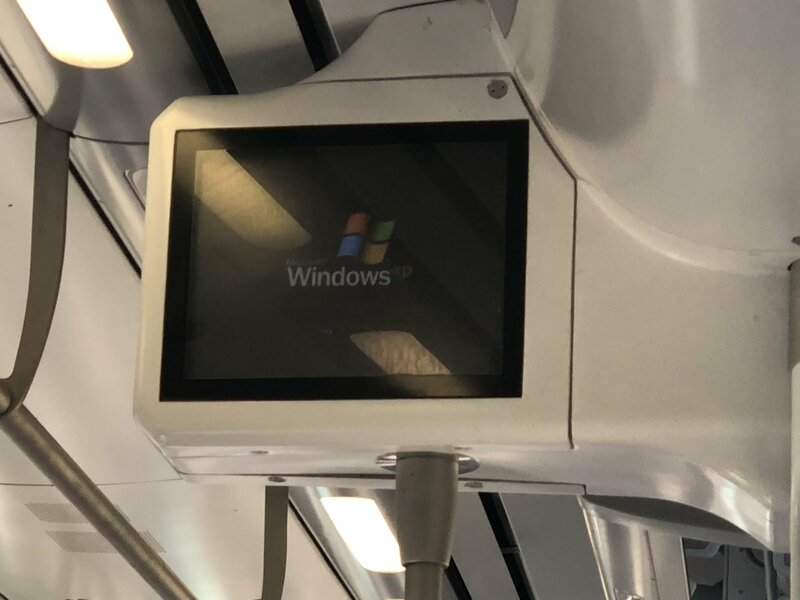 While the service was pleasant, the seats were not. Look at this! 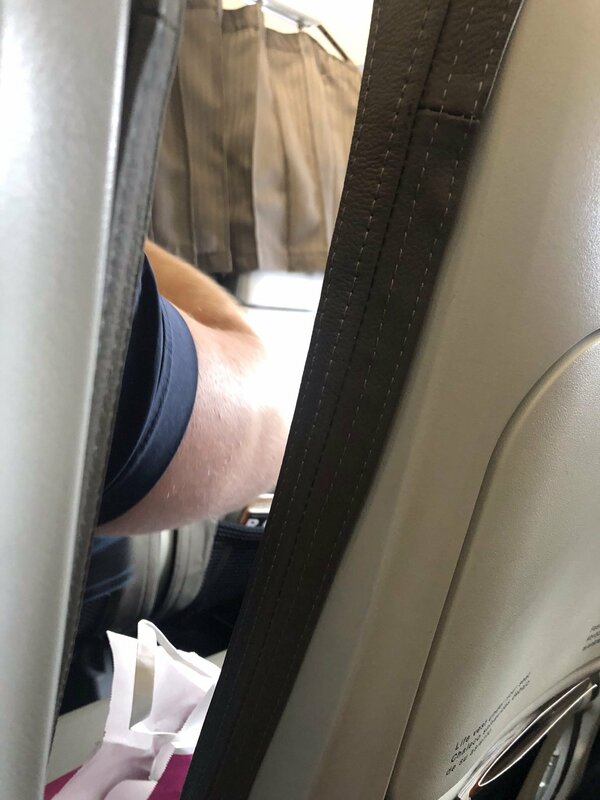 (Not one of my best pictures but I was trying to get a good shot of the seat). They were wafer thin. It felt like you were sitting on a big unfolded cardboard box. These seats are on their way to British Airways’ short haul fleet as well, so be warned! 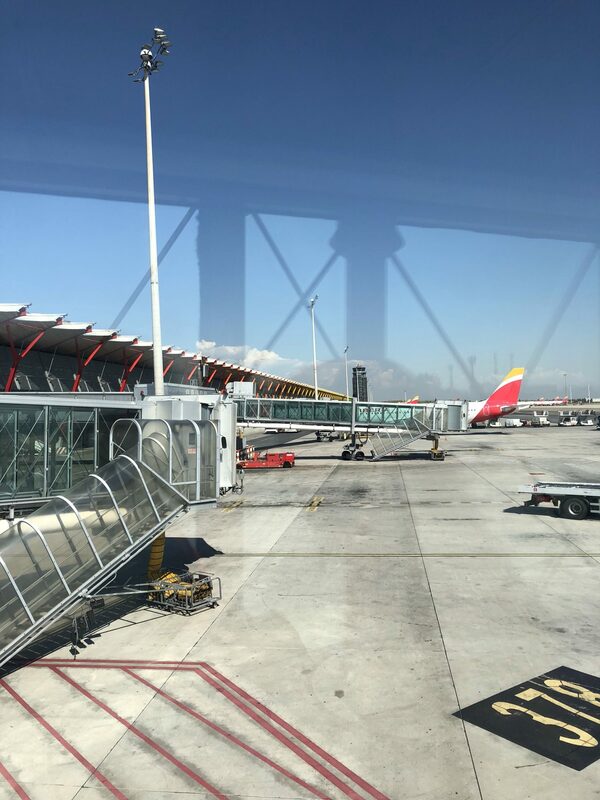 After watching a bit more River City and some Picnic at Hanging Rock, we arrived at a gloriously sunny looking Madrid-Barajas Airport. You could feel the heat while you were still on the plane, which is always a good sign! The architecture of the airport’s terminal 4 is impressive. 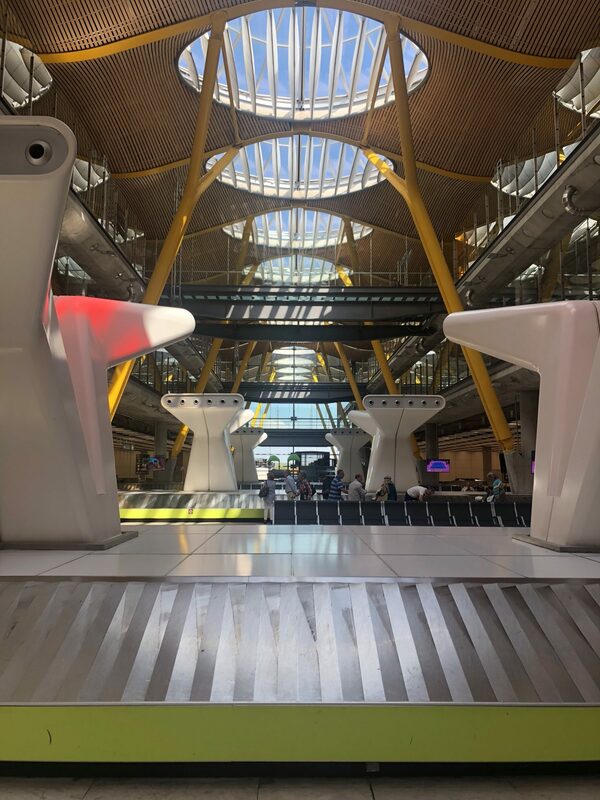 The roof’s interior ripples with undulating wood, while the supporting pillars create a spectrum of colour right down the length of the terminal. A pretty long walk brought me to the baggage carousel, and even there the design was neat. I liked these big end-of-vacuum-cleaner nozzles, even if I’m not sure what they were for! After collecting my bag I found the metro and train station in the basement, and went to buy a ticket. It’s possible to buy a tourist ticket which gives you unlimited travel in one of two zones. The airport is included in the smaller Zone A, so I picked up a 4 day Zone A ticket which cost me €22,60, or just over £20. I’d definitely get my value from it over the course of my trip, so I’d recommend it. 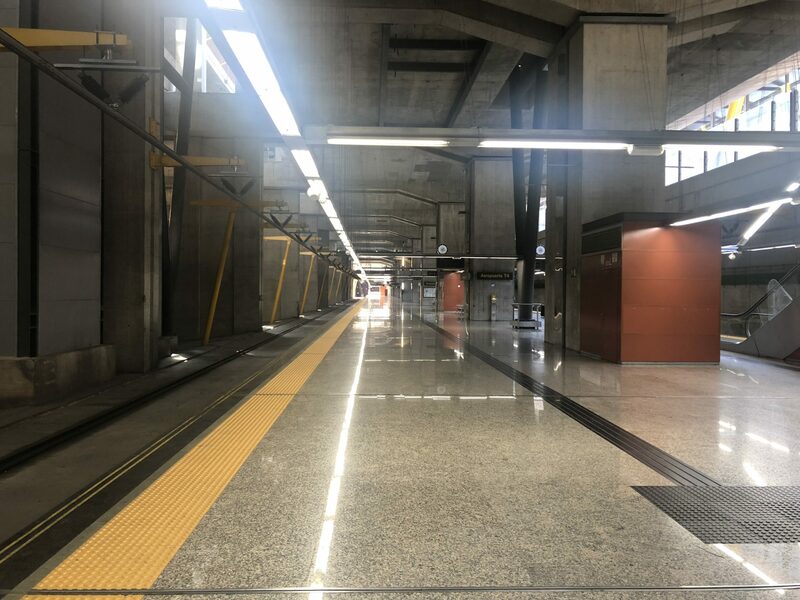 There are a couple of different ways into the city from the airport – bus, metro or train, but I’d worked out the train was going to be fastest. 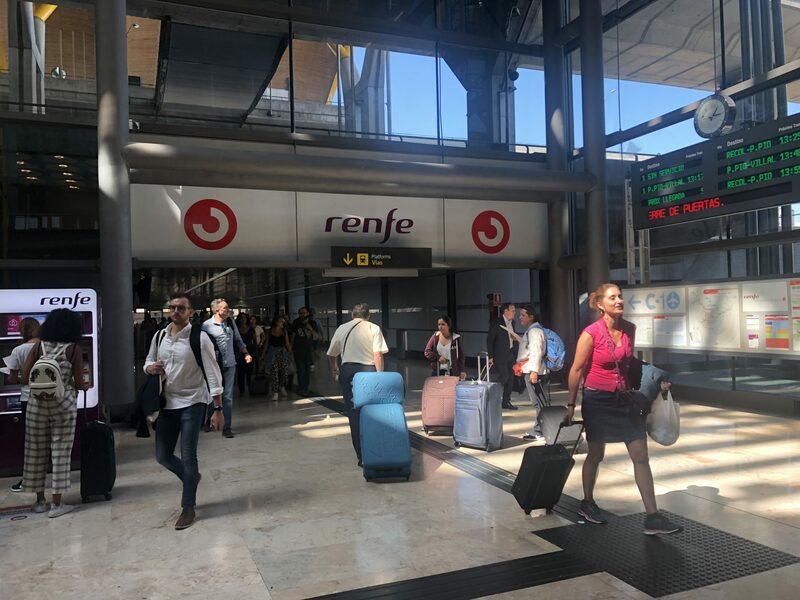 I followed the signs for the Cercanías suburban trains. Then when I got to the platform I had a bit of a feeling I was in the wrong place…. 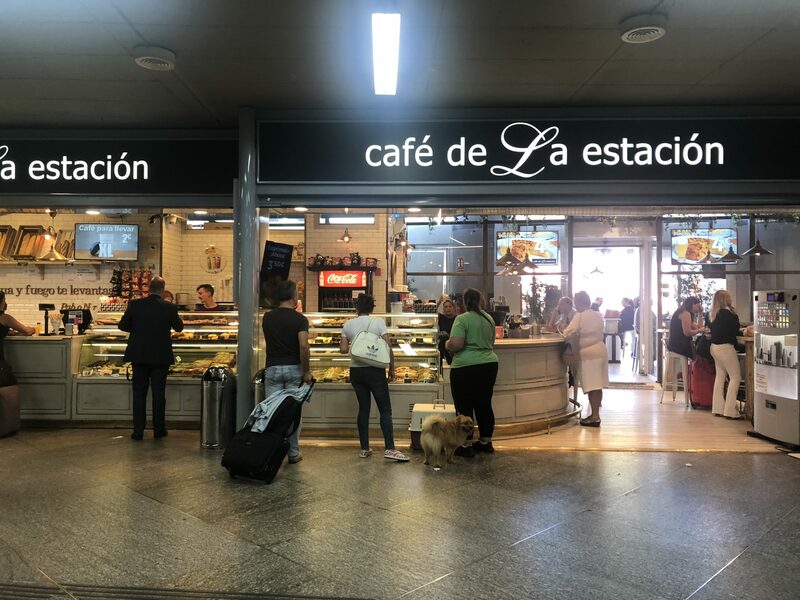 After about half an hour, I arrived at Madrid’s Atocha station, and had a quick wander through it looking for a place to pick up some lunch. 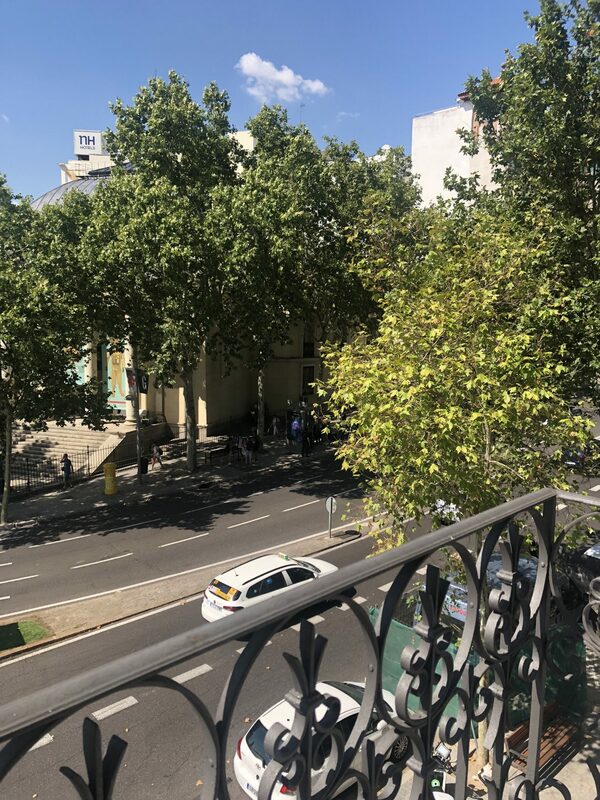 After dragging my suitcase the length of the station and through an adjoining metro station, then up two flights of stairs, I was out on the street, and standing right next to my hotel for the next four nights. Check in was smooth and fast, and the receptionist spent ages answering my questions, and suggesting places to visit while I was in town. I’ll write more about the hotel in another post, but I went up to my room, dumped my stuff and stepped out on to the small balcony. It wasn’t the most amazing of views, but it was great to see blue skies and feel the sun on my face. My ‘phone showed me it was about 31 degrees – which was fine by me! Relieved to have got rid of my bags, I headed back into the station and picked up a sandwich and bag of crisps at a station cafe. 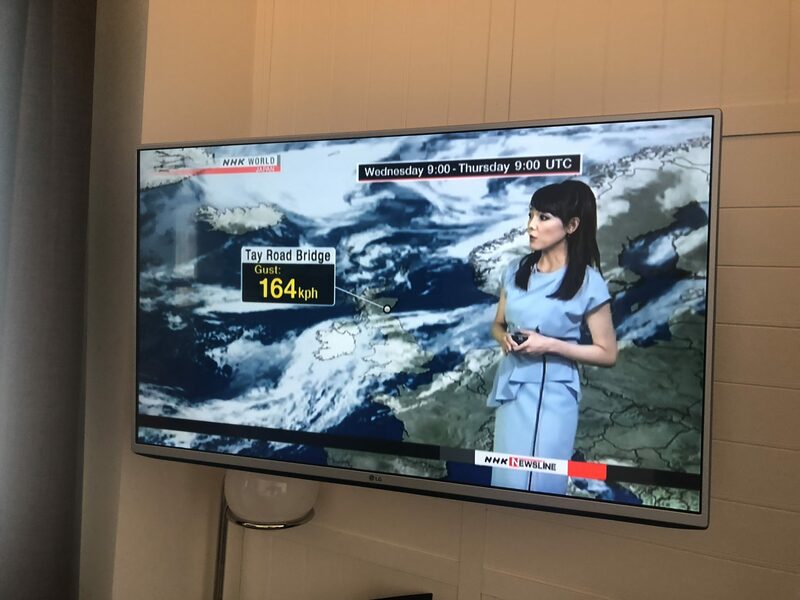 Back at the hotel, I flicked on the TV but found pretty quickly that the English language channels were unfortunately limited to a Bloomberg business news channel and NHK World – the Japanese broadcaster’s international channel. I settled for the latter and was amused to see the weather forecast pick out the wind speeds measured in my hometown! By now the effects of my lack of sleep the night before, the two flights and lugging my bags around was beginning to take its toll. It was about 3pm, and I closed my eyes and fell into a deep sleep…. I slept for a good two and a half hours – I was a bit annoyed, but on the other hand I reckon if I hadn’t caught up on my sleep I wouldn’t have been in a fit state to really do anything. So I clambered out of bed and took a quick shower before setting off to explore a bit of the city. 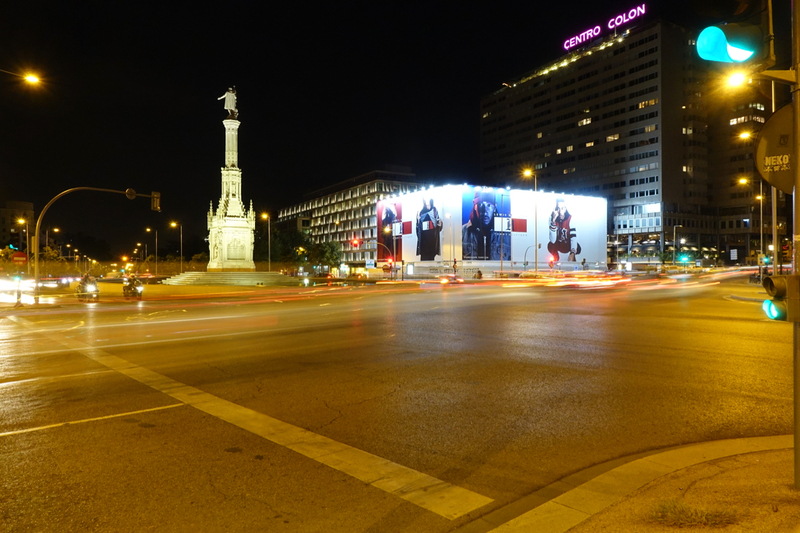 The great thing about Madrid is it’s very much a late night city as I’d discover over the course of the next few days. Shops tend to be open until at least 9pm, while the dinner period for restaurants doesn’t really get underway until 10pm. The centre was about a 25 minute walk away – there was a direct route, but the receptionist had recommended taking a different way in – which would take me past a couple of landmarks. I strolled up the street, which bordered Madrid’s enormous Retiro Park. And got more than slightly excited when I saw this…. I’d had a go on these electric scooters when I was in California over the summer. It seemed like almost everyone in Silicon Valley was speeding about the streets on them. After downloading an app, you can see where your nearest available scooter is. If you want to take a ride, you scan the scooter’s barcode with your ‘phone, wait for it to unlock, and then jump on and go. You can also leave the scooter wherever you want once you’ve finished your ride. Charges are pretty fair – US$1 per ride plus an additional 15 cents per minute. They’re brilliant for quickly getting short distances, but the backlash has already begun in some cities. 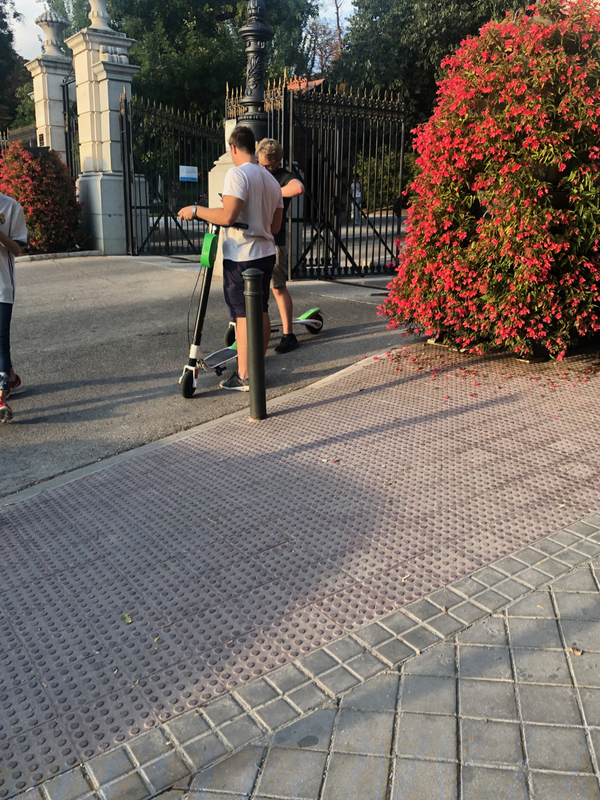 And it’ll be a while – if ever – before they’re in the UK as here, you can currently only use electric scooters on private land. Boo! Anyway, I made a mental note to download the app later on (it was from a competitor to the app I’d used in San Jose) and carried on my way into town. 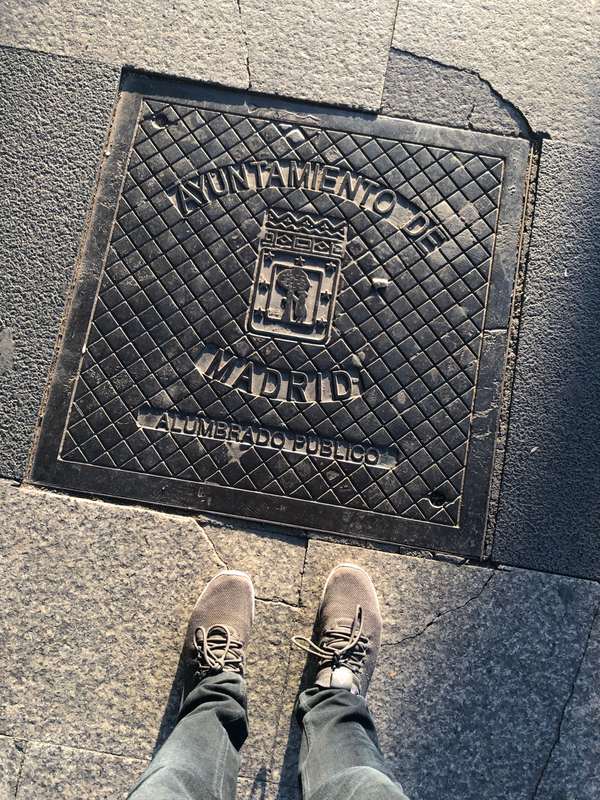 Pretty quickly I worked out that Madrid’s a beautiful city – every side street I looked down was scenic, with beautiful classical buildings on either side. 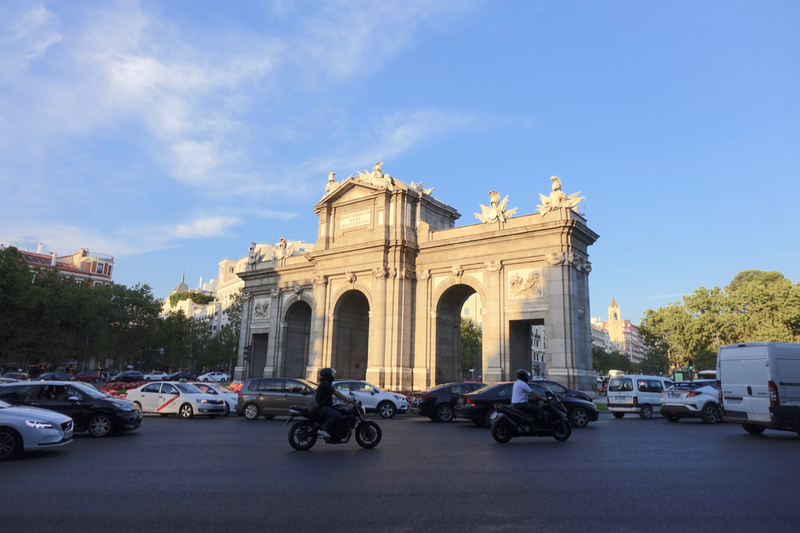 After carrying on up the street, I came to Madrid’s Alcala Gate which once marked the main entrance to the city. Older than Berlin’s Brandenburg Gate, or Paris’s Arc de Triomphe, it glowed in the early evening sun. 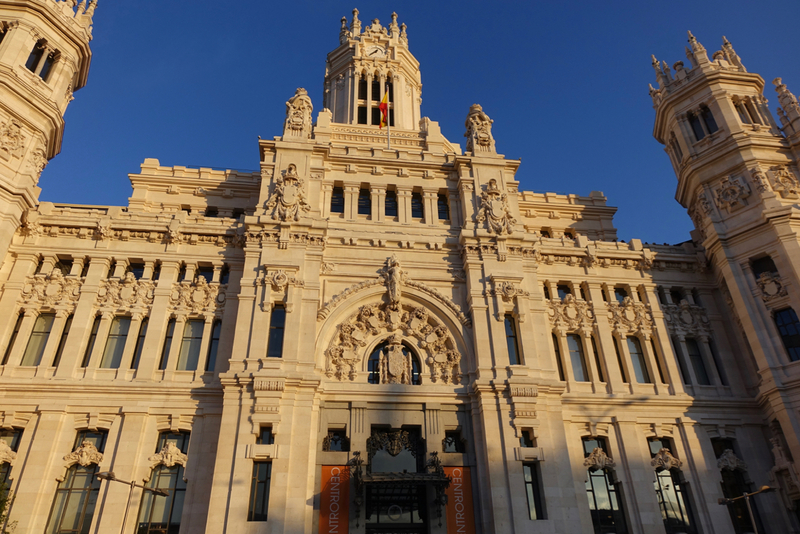 Soon I came to the Plaza de Cibeles – home to Madrid’s city hall. 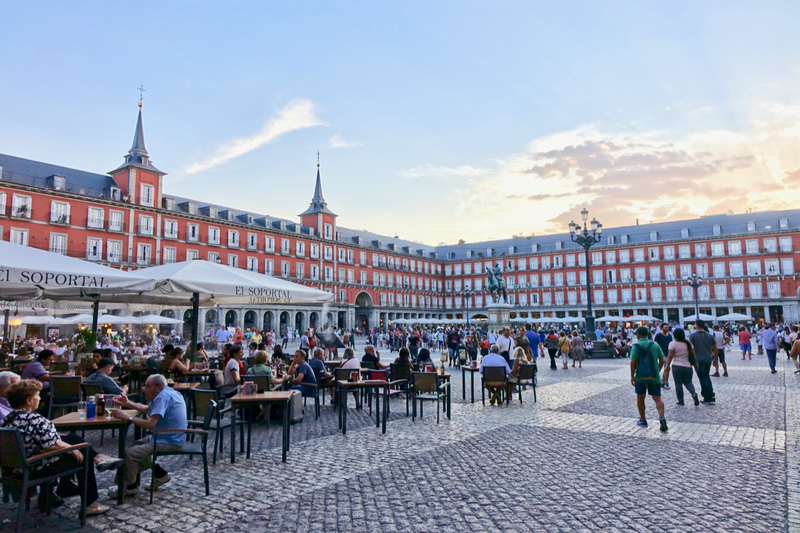 It’s got to be said – Madrid knows how to do big wide streets, beautiful buildings and spectacular avenues and roundabouts! By now I worked out that if I kept going at the rate I was walking, I wouldn’t make it into town before one place I was headed closed, so I decided to jump on the metro. A short ride later, I was ascending the steps of Sol station and was in the heart of the city. 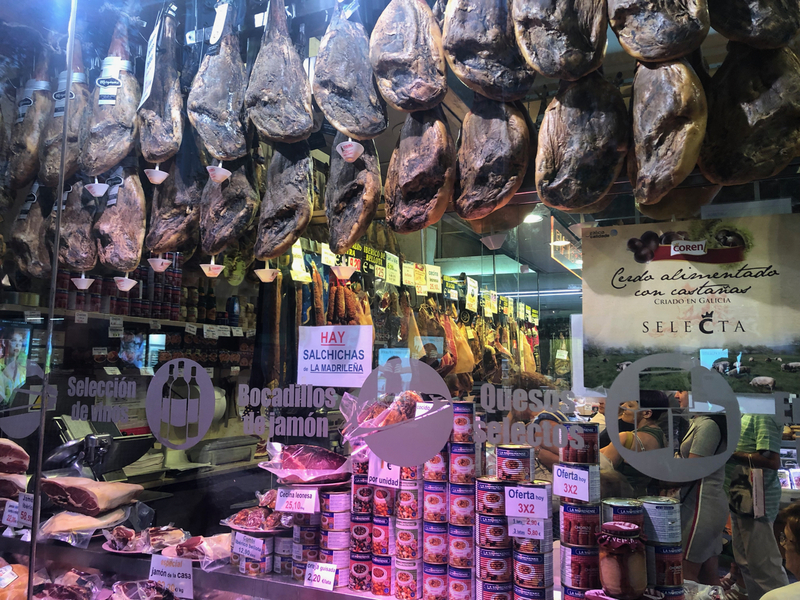 I passed a shop that I made a mental note to come back and look in – with rows and rows of hams hanging in the window. 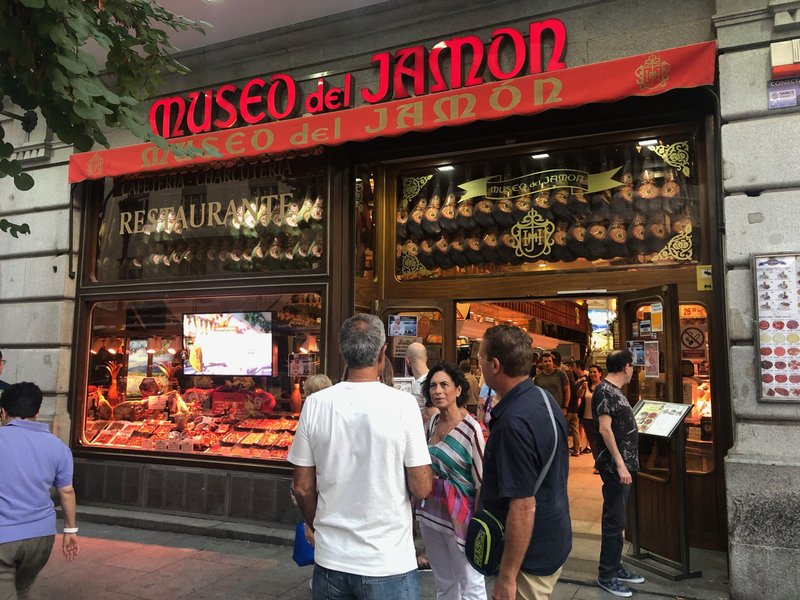 Turning the corner brought me to the Museo del Jamon – which at first I thought was a museum dedicated to ham. … but part of me wished it was actually a museum. It was pleasant just wandering the streets, and the city had a real buzz about it. 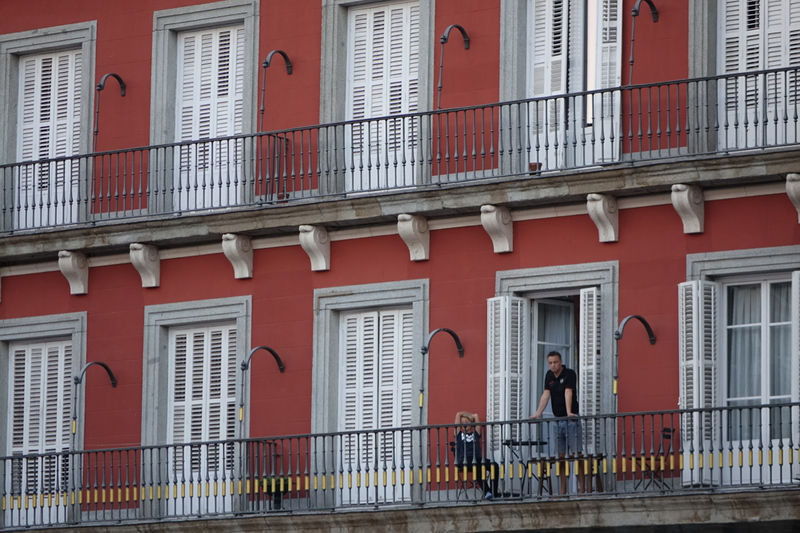 What I liked about it was that there seemed to be lots of people living in the centre. Gazing up you could see Madrid’s inhabitants going about their daily routine or just relaxing, despite the thronging streets below. 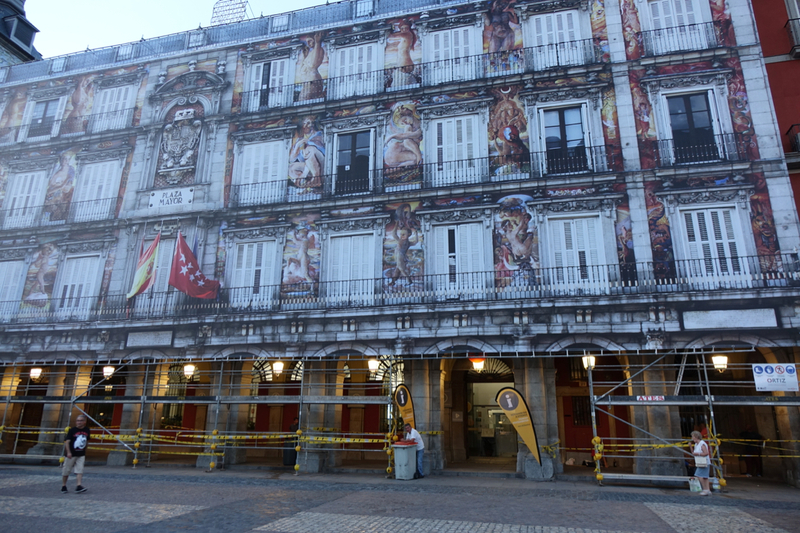 I turned into Plaza Mayor which was lined with restaurants and bars and was abuzz with tourists and locals. Again gazing up you caught a glimpse of everyday life – I wondered who would be lucky enough to live in such an amazing (but probably noisy) spot. 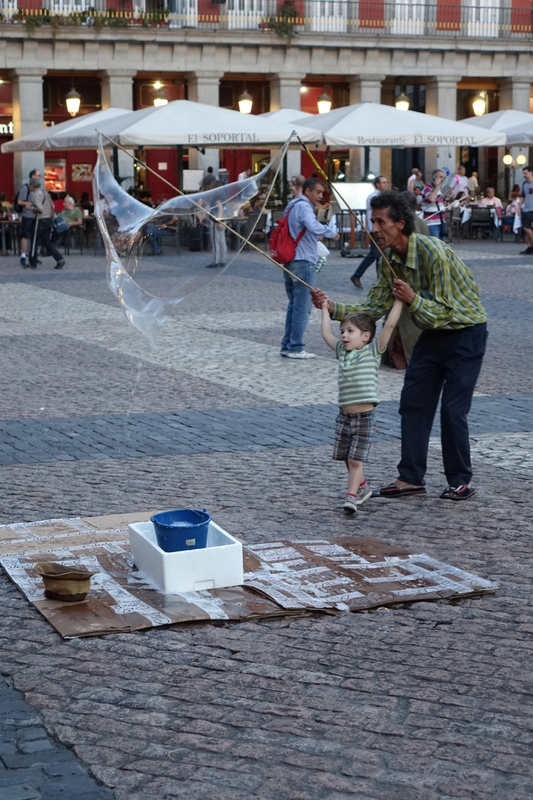 The restaurants were busy, traders hawked their wares, and kids were being entertained. Plaza Mayor‘s where you’ll find Madrid’s main tourist information centre, and I was keen to get there before it closed for the day at 8.30pm. It was covered in scaffolding on the outside, but that had been tastefully decorated to blend in with the rest of the square! Inside, I was surprised at how few leaflets there were – usually there’s loads advertising all kinds of tours and attractions, but I can honestly say I could only see about ten different thin pamphlets. 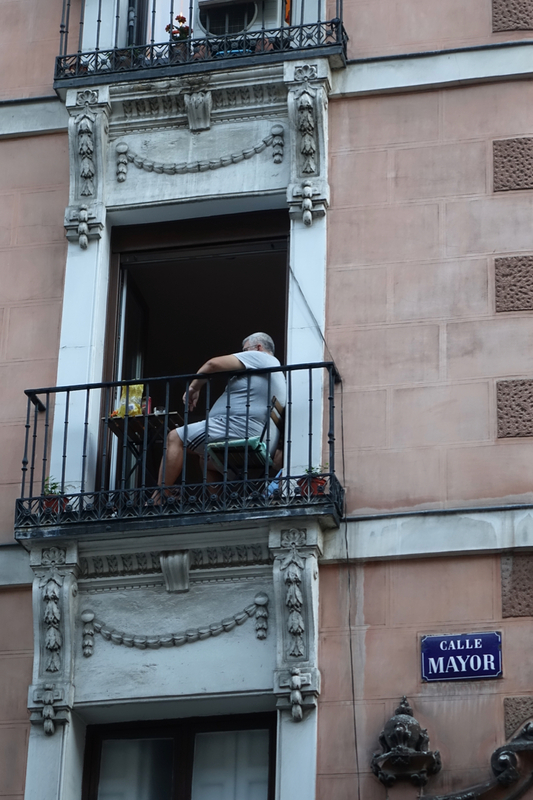 I headed to one of the desks and just had a chat with a guy about what I wanted to see and where everything was, and picked up a guide to the city’s museums, and one on where to find the city’s best views. And it was to one of those spots I was headed next. 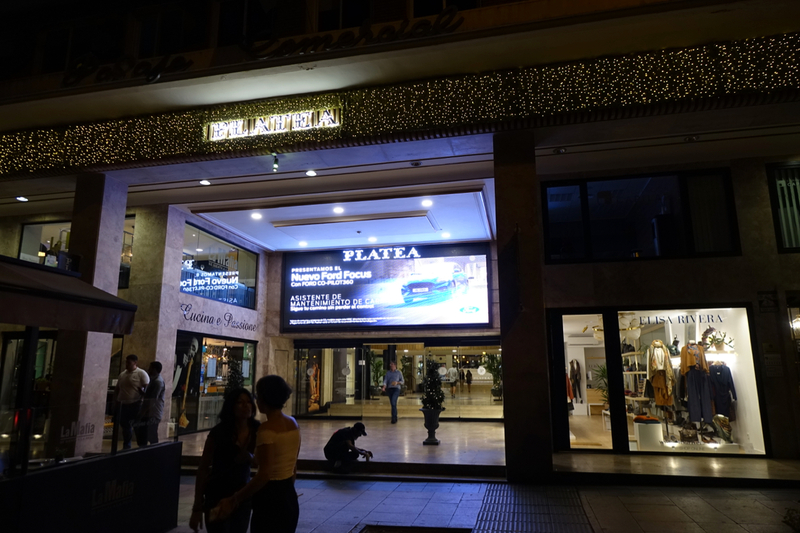 After walking back through the square, I headed to a branch of El Corte Ingles – Spain’s national department store chain. 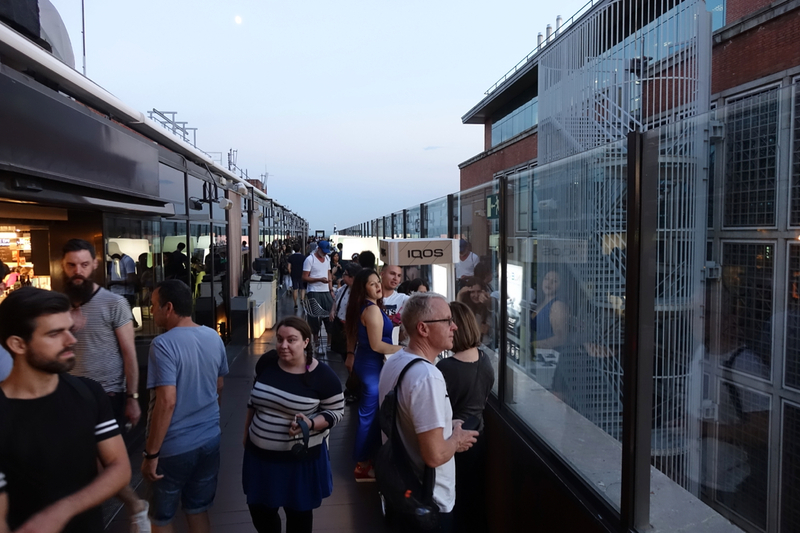 I took the lift up to the 7th floor – where the “Gourmet Experience” offered luxury food items for sale, and where there was also a selection of small restaurants arranged in a kind of food court. Tucked away in the corner at the back however, was a door which led outside on to a terrace busy with people enjoying an evening drink. And it’s from here you can get a great view of the city. 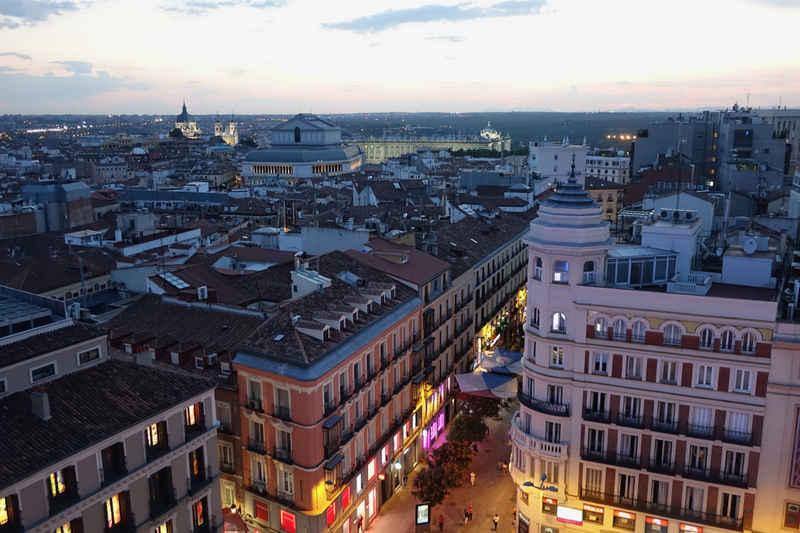 Madrid actually doesn’t have that many high rise buildings in the centre of town, so El Corte Ingles is one of the best places to get a good view of the capital’s rooftops. After grabbing a couple of photos I headed back downstairs, and across the road to one of my favourite shops. 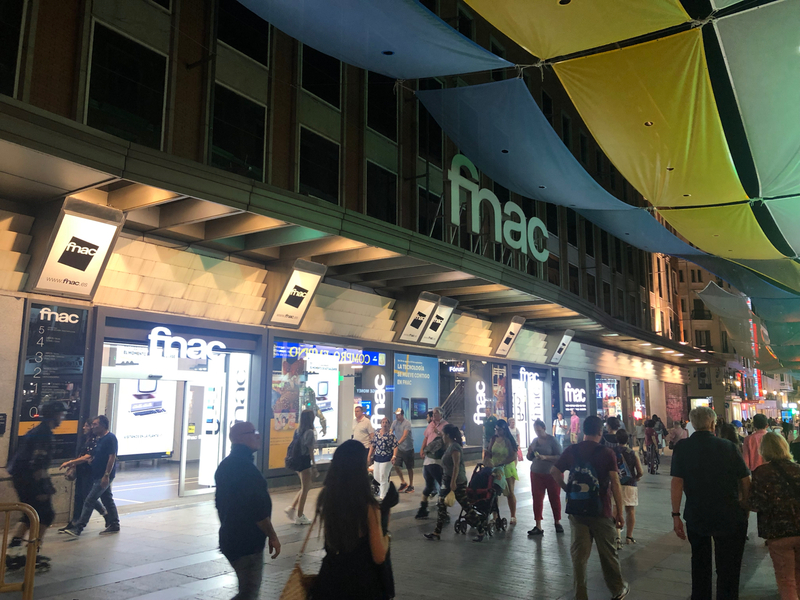 fnac is a French chain which sells music, films, books and electronics. I love that mix of stuff, and the range of stuff they carry is enormous. This branch was in a massive, 5 story building. If only we had branches here in the UK! 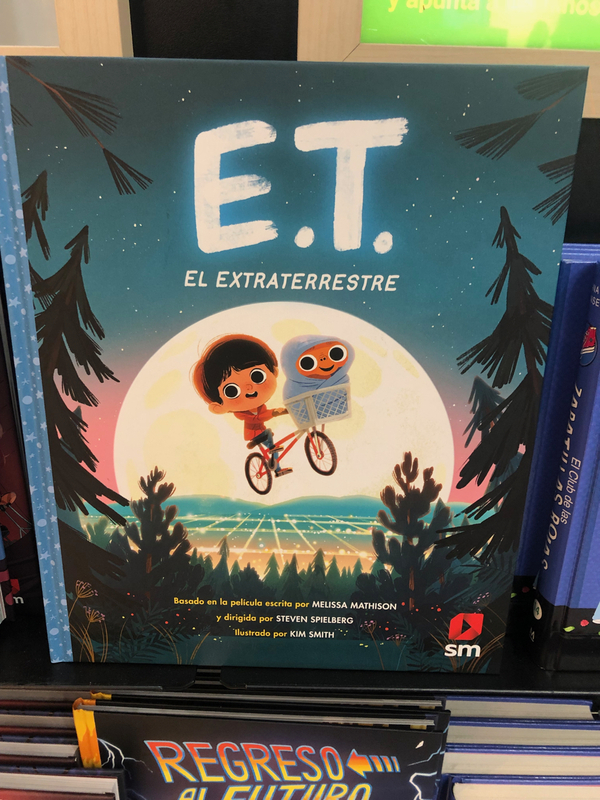 I had a good look around and just narrowly avoided purchasing this ET book (it would have been a bit pointless anyway as obviously it was in Spanish. I did like the illustrations though). 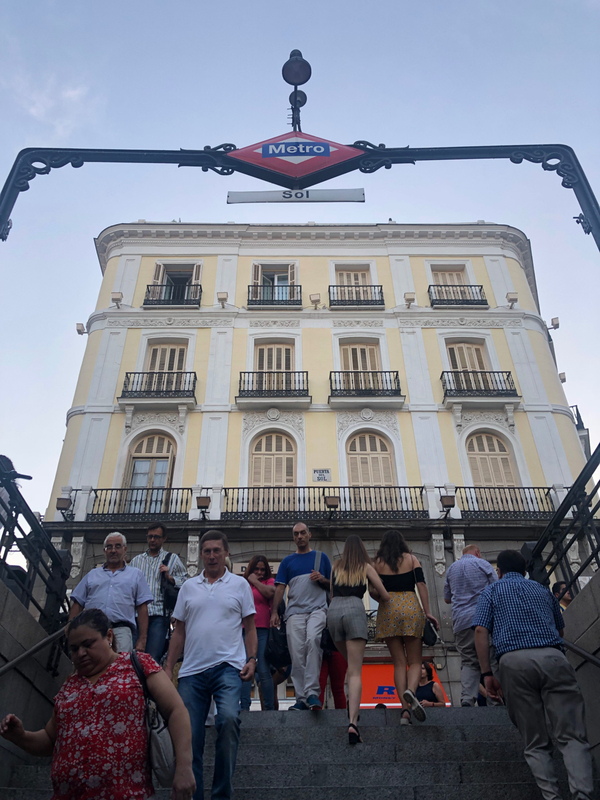 By now it was dark – and time for dinner by Madrid standards. It was approaching half past nine, and by the time I got to where I wanted to eat, it would be closer to ten o’clock. I got back on the metro and headed to the Recoletos part of town. And walking inside it felt like your were just in a quiet, small shopping centre. Stepping through a door however brought you into this space…. 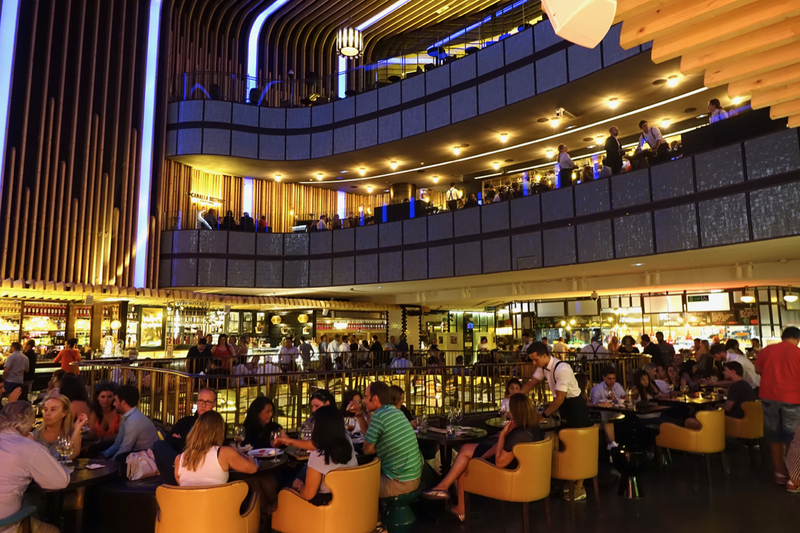 Platea‘s architecture is impressive. 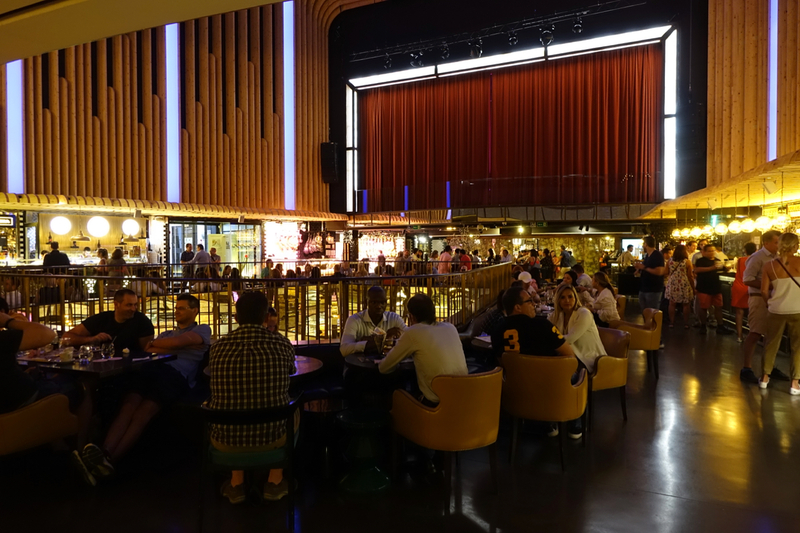 Based in an old cinema, today the space describes itself as ‘the biggest gastronomic and leisure centre in Europe’. I don’t know whether that’s true or not but I liked it. The offerings vary according to the venue’s four floors. 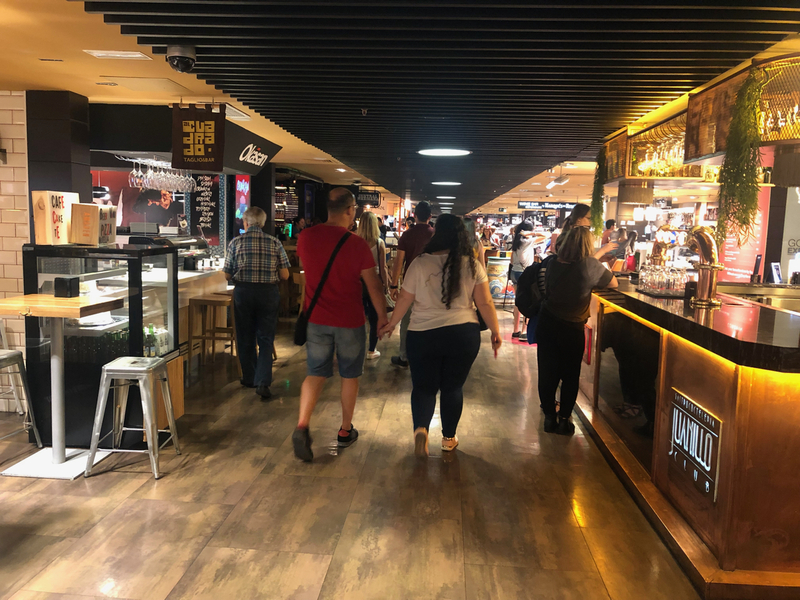 On the ground floor are different outlets offering tapas and pintxos (basically tapas on bread), while downstairs in the basement are more substantial offerings such as burgers, Italian food and so on. On the first floor lies a Michelin-starred restaurant, while the top floor is home to a nightclub and bar. 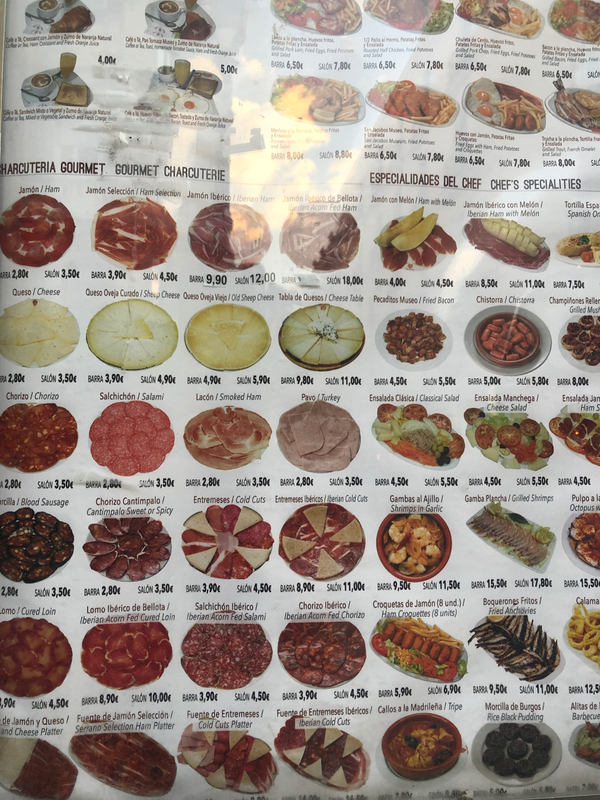 A lady sang in Spanish on stage as I wandered around trying to choose which counter to order food from. After checking out the basement restaurants and discarding the expensive one upstairs, I settled on the ground floor options. Helpfully at one counter, everything was labelled in English,and the staff spoke English too. 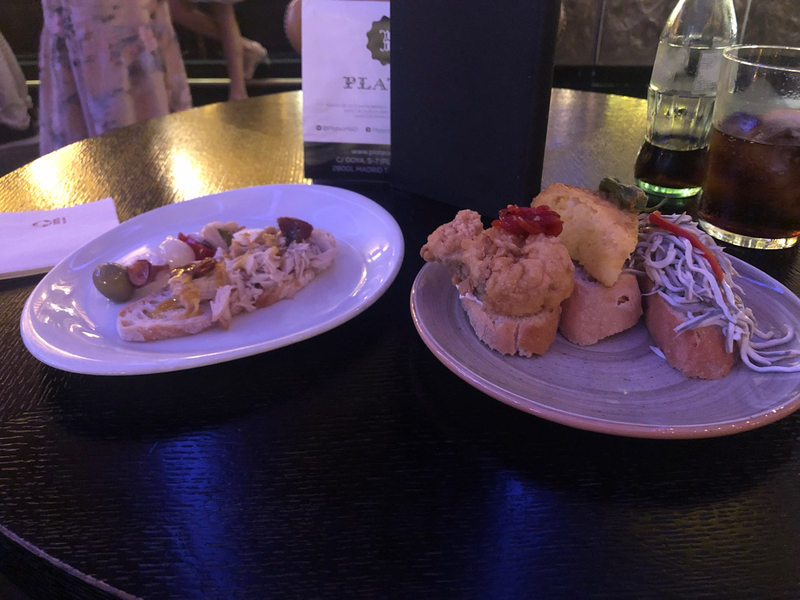 I ordered a Diet Coke, and following the server’s recommendation ordered several pintxos – one with battered cod and garlic mayonnaise, one with tortilla, and one with ‘fake eels’ – whatever they are! I couldn’t resist ordering some other options from another counter too – tuna on toasted bread, and a little stick containing olives and peppers. I sat down at the table and tucked in. 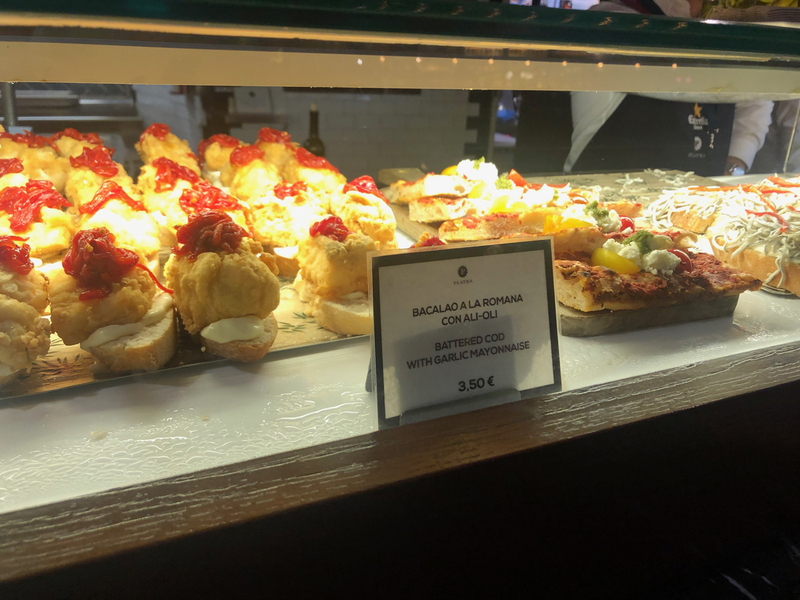 The three pintxos cost me €9,30 which was about £8.29 at the time. I guess that’s not too cheap, but I think you are paying for the quality of the ingredients. The tapas were around the same kind of price, with the little stick being cheaper. I didn’t know it at the time, but I’d be back in this very spot less than 24 hours later, but for now, I took one last look at the beautiful space and stepped back outside. Feeling tired again already, I decided to take the metro back to my hotel. 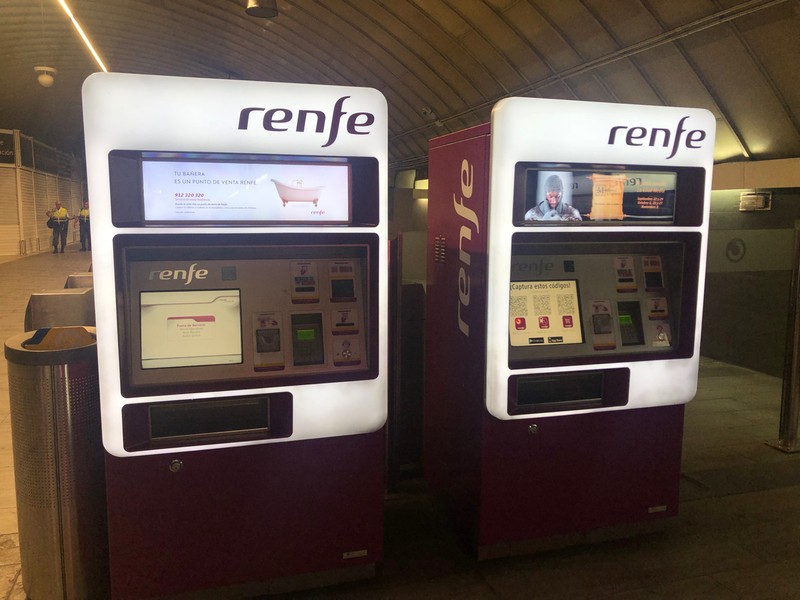 Walking through the station I noticed that Spanish train ticket machines are very fancy – the top of each machine was showing video adverts! A bit better than our clunky machines at home! I had a pretty busy day planned for Friday, and had pre-booked breakfast for the next morning, so after catching up on that night’s EastEnders in my hotel room I switched out the lights and fell asleep pretty quickly.